FIFTH & J STREETS – Adapting to today’s harsh economic conditions requires flexibility and innovation, and two resourceful Arcata businesses have found a synergy that benefits both. Finnish Country Sauna and Tubs has formed a partnership with Japhy’s Soup Kitchen to offer new “Soup Tubs” out behind Café Mokka at Fifth and J streets. 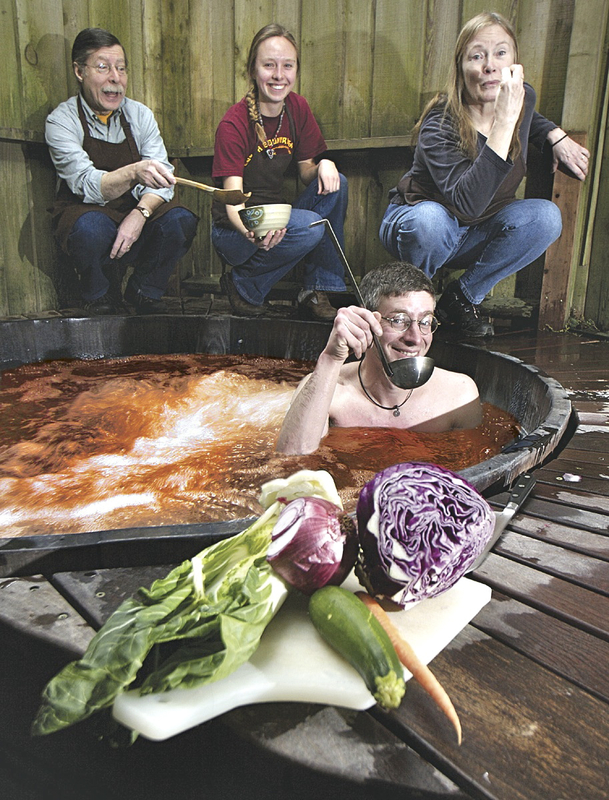 There, three of the Finnish-style hot tubs have been reassigned to tureen duty, offering patrons a relaxing, nutritious and newly flavorful tubbing experience. On Monday, one tub is partly filled with dried lentils, another with split peas and a third with beef boullion cubes. The tubs are then filled with hot water, and as the ingredients rehydrate, a chef from Japhy’s pays a call. Marketing the bathwater bisque has predented more opportunities for innovation. As they enjoy their tubbing session, patrons may eat all they want by simply leaning back, submerging to nose level and opening their mouths. Also, for a $5 surcharge, one may bring a thermos, fill it up and take home a complimentary serving. To offset that charge or to take a $5 discount on a tub session, you may elect to bring an ingredient to donate to the mix – a head of celery, some radishes, onions, carrots or other organic-only veggies. No leeks, though. “No one wants people taking leeks in the tub,” Henerson said. Customers have embraced the concept. “We love it,” said regular patrons Dave and Rachel Hendry. They’ve even learned to work subtleties of the new system to advantage. By Wednesday, though, the ingredients – including those donated by other tub-users – are well-cooked, flavors have flourished and the soup stock is thick and bracing for a cold winter’s night. By Friday night, the mixture has thickened into a stew-like sludge, and by Sunday morning has the consistency of wet cement. Interestingly, it tends to set like cement too, so at this point the tubs are scraped out and the remaining contents donated to food banks. Henerson said that with the success of the soup tubs, he’s looking into modifying the business’s saunas as well. At first he was going to use them as veggie cookers and offer a “Sauna and Steamed Veg” service, but now he has other ideas. Note: An earlier version of this story was first published April 1, 2009. – Ed. This entry was posted on Sunday, April 1st, 2012 at 1:23 pm	and is filed under News, Community. You can follow any responses to this entry through the RSS 2.0 feed.